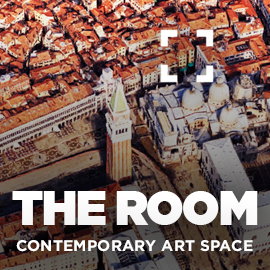 Luca Curci talks with Dide Siemmond during Contemporary Venice at THE ROOM Contemporary Art Space in Venice. British author, composer and interdisciplinary artist, Dide Siemmond has written seven books and a theatre play; composed music, sometimes using a composition method she designed herself; and created interdisciplinary cross-medium art. She has been described so: ‘Dide has stood apart, as an individual capable of shifting literally trends and genres, with the ability to create new profound content, which could be pertinent to audiences the world over’. Some life experiences after studying at the University of Cambridge, London’s Royal College of Music JD and Switzerland’s Lausanne Conservatoire of Music include learning six languages; living around the world, such as France, Germany, Turkey, India, Japan and South America; and working as a translator, editor, writer, singing teacher, English teacher, violin teacher and journalist. She is researching for her forthcoming theatre play, commissioned by a touring theatre company. 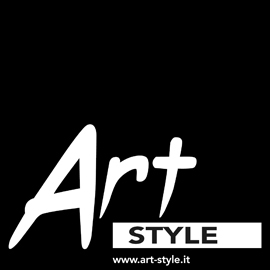 Luca Curci – Do you agree with our vision of art and what you think about the theme of the event? 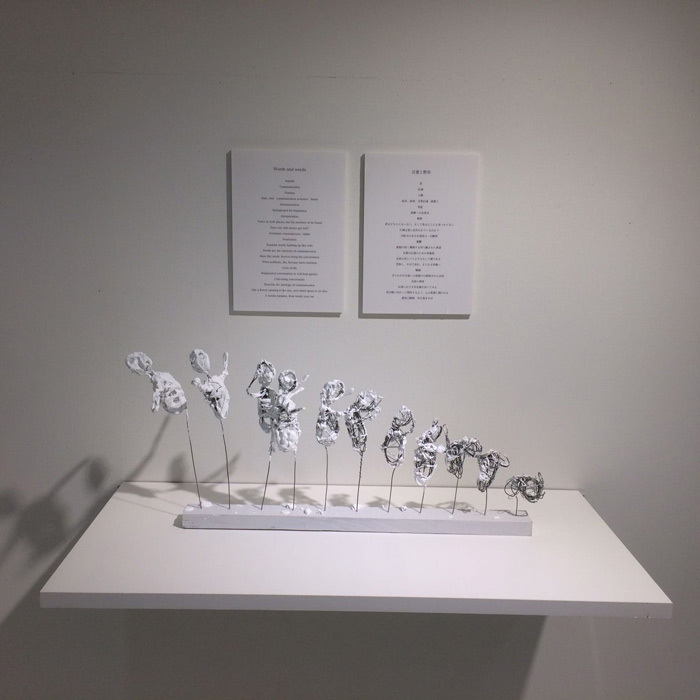 Dide Siemmond – Taking your vision of art to be based on ‘fluidity, motion, connection and accessibility’, I agree that art is fluid in that it can move between and encompass different forms, mediums, minds, time periods, meanings and boundaries in interpretations. Moreover, art is not set like stone, even though it can incorporate stone, because the very definitions of art itself change and flow with the times too. I support this open, free conception of artistic expression, especially to create change. 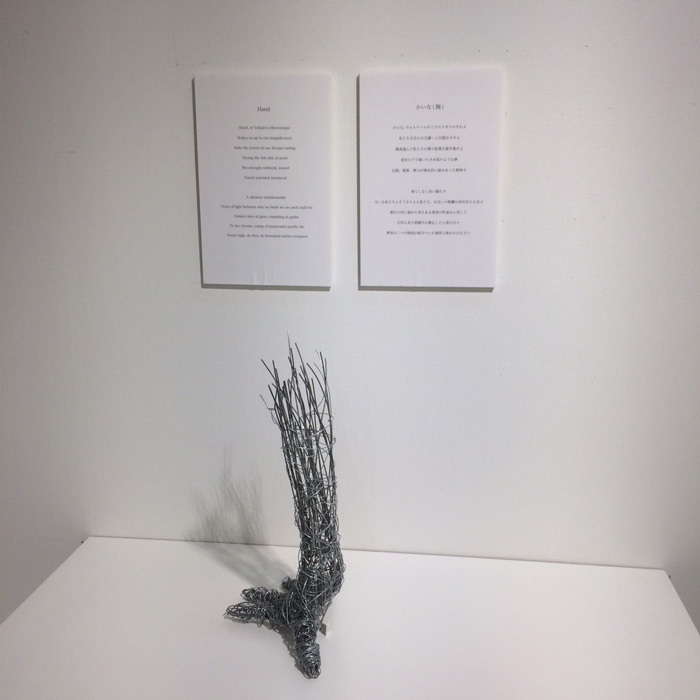 The theme of the event – contemporaneity as a source of inspiration and a starting point for new visions of the world – is something I can relate to and which often fuels my own work, despite trying not to remain too time-specific. Through looking at the contemporary, we can learn about universals, and this is something that excites and interests me. L.C. 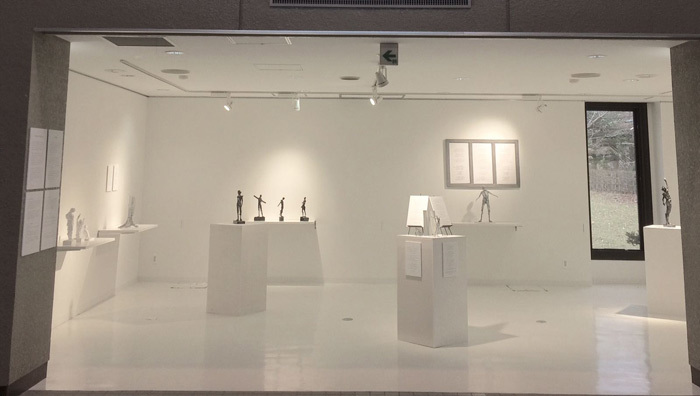 – In which way the artwork presented in our exhibition is connected with the event’s theme? D.S. 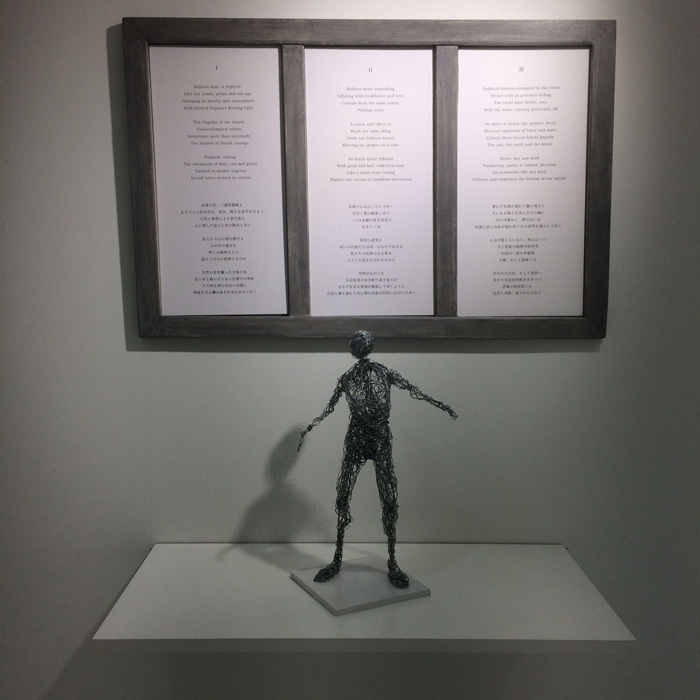 – Our artwork combines sculpture and poetry, linking not only different mediums together but also different interests and different minds – that of the sculptor Tobias Ford and that of the poet, myself. 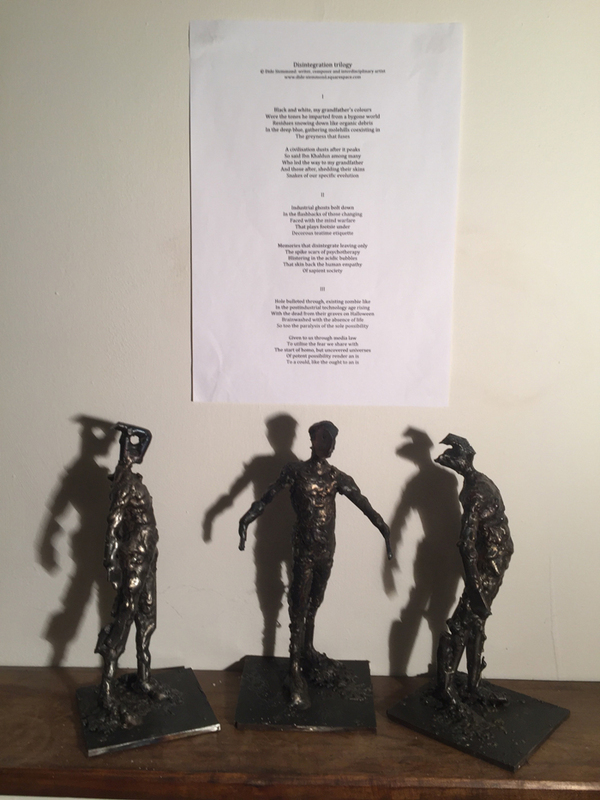 Having said that, we have also created other artworks (like one of the photos attached), which I also sculpted and Tobias, wrote. 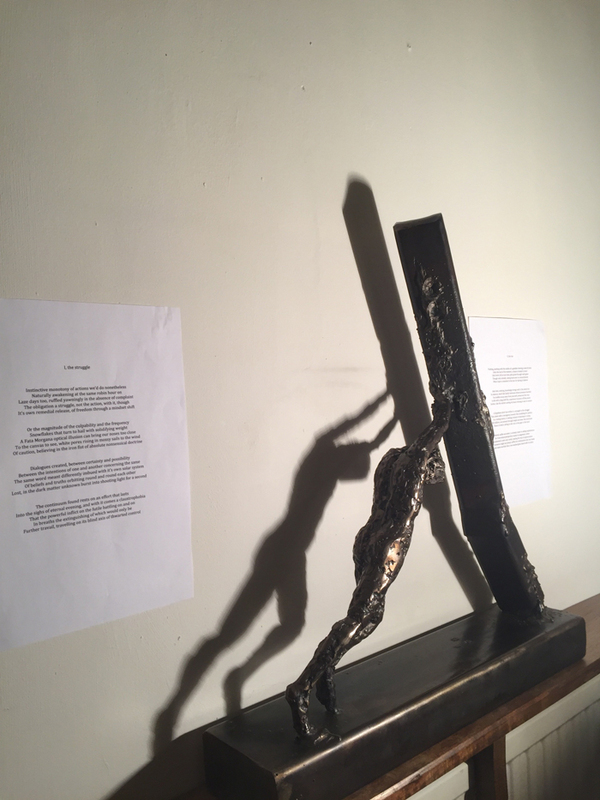 With the artwork presented in your exhibition, the idea was not that the poem would represent the sculpture, embodying the same concerns, but that the poem would take the sculpture as a starting point from which a different mind would explore different concepts. 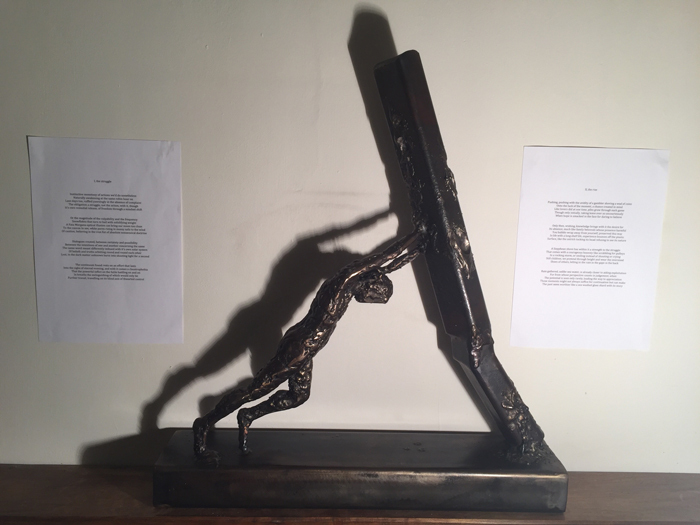 In this way, contemporaneity, the theme of the event, is clearly dealt with in the poem, which, to simplify, discusses anachronistic ideology that no longer fits our current society, i.e. outdated views that still hypnotically allure people when they should perhaps be looked at again. Sometimes with progress, we are tricked into thinking that we are progressing when perhaps we are not in every way, some actions failing to take hold due to being badly thought out and implemented too early. Current society also forces us to sell ourselves in various ways. Many signs of control are false and in certain ways we are intrinsically constrained, yet there is still freedom to a certain extent even when we think there’s not. 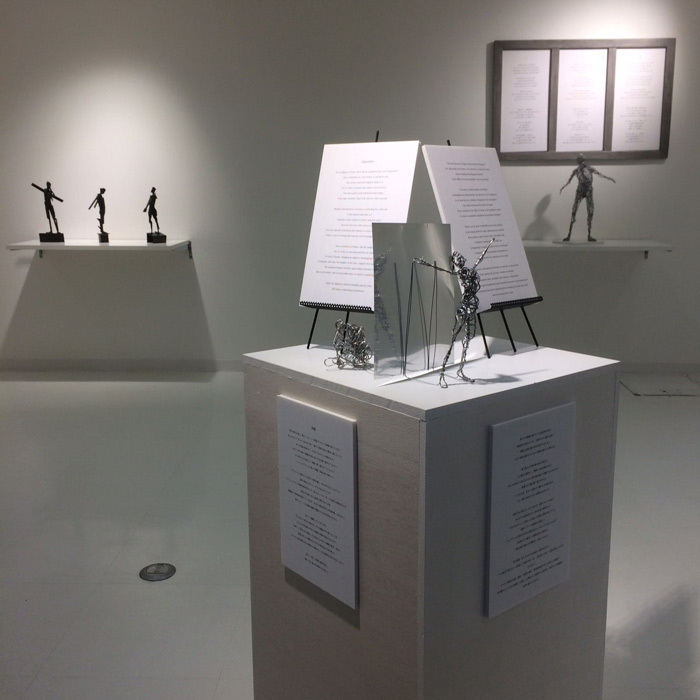 The poem explores these themes, present in contemporaneous society, all the time using the sculpture as its main metaphor and source of inspiration. D.S. – The artist, like each human being, is free to choose his or her role in society. It would be restrictive to say that all art need be political in encouraging change, scientific or philosophical in promoting further knowledge, cathartic, escapist or entertainment. Within our economic environments, though there is a need to earn and survive, true art is not concerned primarily with merchandise, but with honesty, to its own founding principles. For me, these founding principles might be aesthetically expressing my thoughts on humankind in general, from the time-specifics in our current society, to the universals that have governed our existence as well as the existence of others in general. 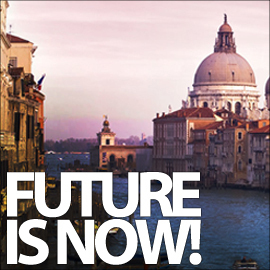 The aim is to explore, push boundaries, strip back superficiality and attain further understanding. L.C. – What’s your background? What is the experience that has influenced your work the most? D.S. – I’ve had quite an eclectic background. Interested in many different things, I like learning, be that from art to quantum physics or neuroscience. I initially focussed much of my life on music, before focussing on writing, before linking the two, and then going on to link both with visual art in different ways. I hope to continue exploring different mediums. I am, however, currently primarily a writer who mixes other interests into this. Different mediums have their different strengths, which might make them more or less suited for certain purposes, however, innovation comes from exploring their boundaries. One way to do this might be to approach a medium as if it were another. Since such exploration interests me, and since I tend to transfer my belief and identity core from one realm or medium to another, my impetus is slightly different to desiring to master one medium. It’s difficult to choose an experience that has influenced my work the most. My work and me, though not synonymous are very tightly knit, so that all the experiences that have made me me affect my work. Also, one experience might have affected my approach more, and another, my views. D.S. – I find inspiration in everything – in daily life, personal interactions and general news. I also read a lot. I used to read a lot of fiction but since 2014, though I do read fiction from time to time, I tend to read much more non-fiction. I find that this is another great source of inspiration, other than life in general, especially in providing me with similes, metaphors and analogies for my deeper beliefs, but also in educating me about topics I might not know enough about. The activity of reading has changed and is changing a lot, in that information is sometimes shorter and more immediate, so that though I go through phases of traditionally reading a lot or not a lot, information filters through in some way or form. 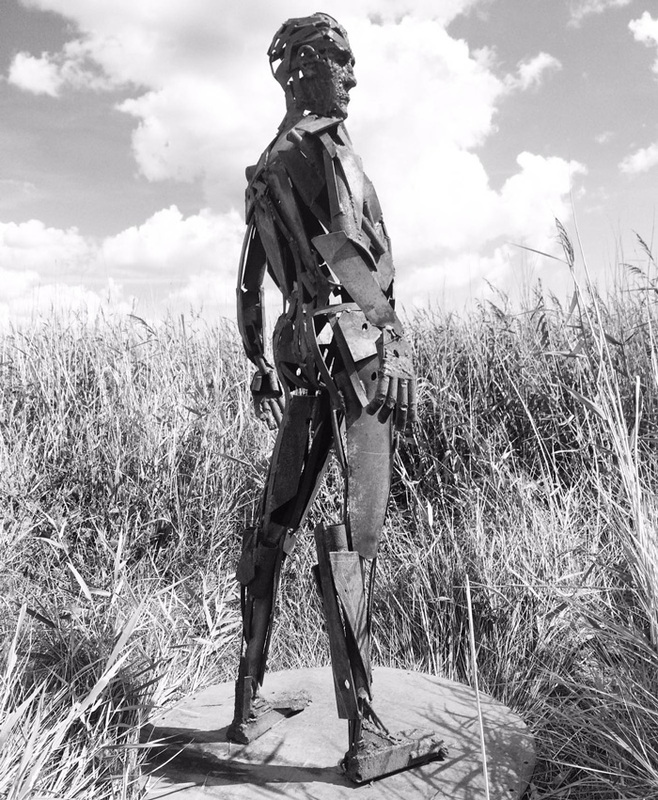 Tobias, on the other hand, finds creative inspiration in the figurative world around, from the line, gait and weight of a pose, to the intent and movement created. D.S. – For me, the most challenging part of creating my art is to remain in a mentally protected state that allows me to think about my art and other things. Since a lot of my work is mental, or at least might have a mental component or beginning, I need a certain mental space to be able to dedicate the right type of concentration to my work. Of course, I can and do often work in more confused states too, and this is not always counterproductive, because art has a way of making links and growing into something almost of its own, as well as responding honestly to each state at a time. Another challenging part of creating art – one that Tobias also feels – is making the time to create art, in between financing life and other commitments. L.C. 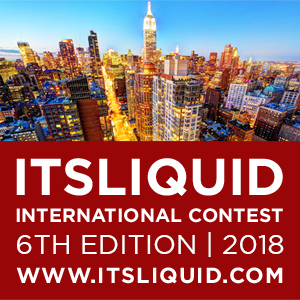 – What is your idea about ITS LIQUID GROUP? D.S. 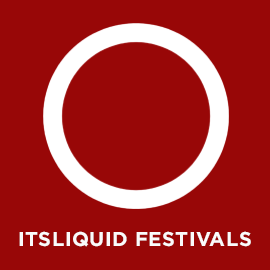 – I think It’s Liquid Group has a really good aim in giving artists the opportunity to reach out to other parts of the world, through exhibitions and publicity. 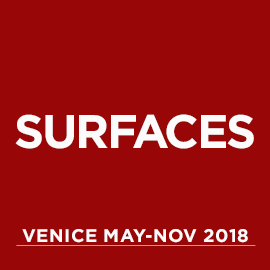 It is a mediator between artists and gallery owners, in more fairly representing the varied mix of artists out there at the moment and adding to the global exchange of ideas. For artists, it is a way to make their work known in places that are far away. 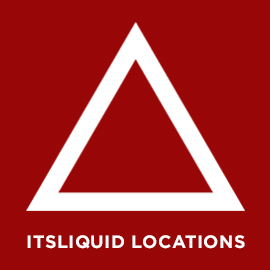 I’m sure each artist who has worked with It’s Liquid Group has been appreciative for the publicity at least that It’s Liquid Group has provided them. D.S. – I had a very good interaction and communication with you. Correspondence was professional and human, in terms of being responsive to situations. It’s always slightly unsettling sending off artworks to places without delivering them personally, but It’s Liquid Group made me feel comfortable enough to take the risk to do so. Thank you! You’ve been a delight to work with.